Tev Stevig is a Boston-based guitarist and multi-instrumentalist, specializing in a variety of plucked string instruments. His current projects include Çeşni Trio, which explores original music inspired by Eastern modal music forms for tanbur, fretless guitar, oud, and saz; Ivo & the Wave Wranglers, Tev’s Balkan surf rock and Banitsa Western power trio; and Jeni Jol, which is dedicated to his arrangements of music from the Balkans, Greece, and Turkey for clawhammer guitar. Join the mailing list and get a free mp3 and additional content from the Clawhammer Guitar Series! Been a while since I posted anything. Lots of news to report! The Late Risers have several residencies every month: every 2nd Sunday (except as noted) brunch at Club Passim in Cambridge, MA and every last Sunday of the month at Aeronaut Brewery in Sommerville, MA. Check the Calendar page for more details. We will also start up our residency 3 days a week (Wednesday/Friday/Saturday 12-2pm and 5-7pm) in the Downtown Crossing district of Boston in May. Contact me for details. Music from the new album featured on PRI's "The World"
Cuperlika, a track from Jeni Jol was recently featured on Public Radio International's syndicated news program, "The World." My playing was also heard in this same program on a track from Mr. Ho's Orchestrotica's new album. Check it out here! 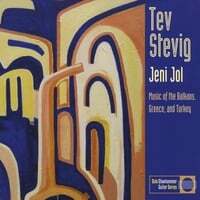 Jeni Jol Album Now Available! Pick up your copy of the new album at one of Jeni Jol's live shows, CDBaby, Amazon, Itunes, or anywhere you buy new music.